Simple Open Source client solution for file synchronisation. SparkleShare is an Open Source client solution in the field of file synchronisation. It is the ideal collaboration tool for file management and a better alternative for Dropbox, because it supports versioning of documents. Even technical not so gifted team members can easily use SparkleShare. All they have to do is to save their project relevant data into a local project file on their desktop surface. It is automatically synchronised with the Git repository of your Redmine managed hosting instance. All projects members get the opportunity to work collaboratively on all project files. We think that is awesome! The principle is the same as Dropbox: all project files are stored on the team members hard disc in a special folder and will be synchronised with the Managed Redmine hosting server. Which means, you can work with your data even without internet access. The next time you have internet access your files will be automatically synchronised. Encoded file transfer: The file transfer takes place encoded. Authentification file: An authentification file is needed instead of password authentification. Server location Germany (or any other country you want): All your files are securely stored on your own TEAMWIESN server instance. Directory restricted user access: You have several directories for the synchronisation. Every directory (Sparkleshare repository) does have an own access authority. Activity protocols: It is seamlessly integrated into your hosted TEAMWIESN Redmine instance. In case you change, delete or add data information, every activity will be monitored and is ready to get restored. Open Source and operation system indepent: Get the software for free. Available for Windows, Linux and Mac OS X.
Git and SSH: For technical geeks: Git is used as backend and the files will be securely transferred by SSH. In order to access the file depot on your desktop you need to install SparkleShare. After the successful installation process your personal key is presented to you. This key is very important. Save it and give it to your server administrator, who will register it on the AlphaNodes Redmine server instance (otherwise you do not have any access to your SparkleShare file!). You find this key as well as in your Home-directory in the sub directory called "SparkleShare". The file name contains your name (e.g. "Kims link code.txt"). After installing the software on your desktop add your repository by clicking on the menue selection "Sparkleshare" / "Add Hosted Project". In order to use the name you need to place there look further down in this text. 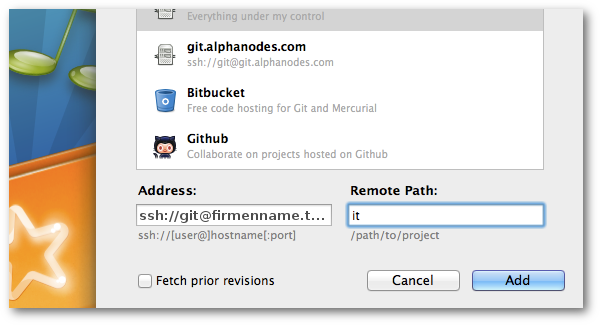 Fill yout the "Remote Path" field with the name of the desired repository, e.g. "it". There you go! Note: In case you want to add several repositories, proceed for every one as mentioned above by using the given name. In every repository main directory does the “SparkleShare.txt” file exist. Do NOT delete this file and do NOT change it.